Br. 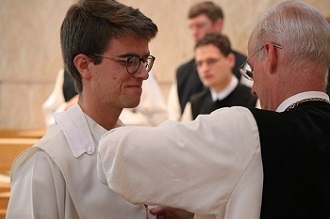 Zechariah receives the habit of the novitiate. The first step in a lifelong program of formation, the novitiate year is the most important, for it is one’s first experience in a life of conversion in which the novice responds concretely to Christ's call: “Leave everything... and come, follow me.” During the novitiate the novice is introduced to the monastery, the “school for the Lord’s Service” (Rule of St. Benedict, Prologue), as he begins to listen to both the One who called him and to his own inner self as he responds to the call. In learning both about his call and himself, he discovers his limitations and obstacles as well as his potential. He also learns about the resources at his disposal: the guidance of his abbot, his novice master, the community and the Order with its traditions. And most of all, he learns about the power of grace that can help him overcome the obstacles and limitations. Br. 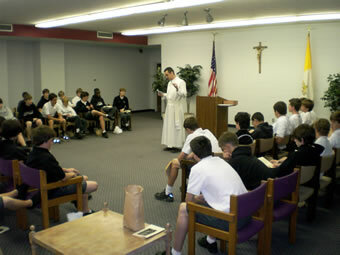 John talks to the Form IV Retreatants. As the rite of taking the habit says, the novice has the task of divesting himself of the “old man” – his sins and the merely secular goals and habits that lead to temptation and sin (cf. Ephesians 4:22-24) – and of putting on the new man. He must put on a new style of thinking and live as Jesus did in obedience, chastity and poverty so that love for God and neighbor flourishes in his heart. These tasks make it necessary for the novice to be, in some sense, “uprooted” from his previous life and relationships. Such an uprooting requires that he distance himself from his previous life, including his family and friends, in order to direct and focus all his energies on seeking God in the monastic community. Concretely, the novitiate is a focused period of formation and discernment normally lasting one year. During this time, a novice participates in the prayer life of the community, in addition to spending specific periods of the day in private prayer and spiritual reading. After prayer he will work at his assigned “house-hold” chores and attend a variety of classes offered by the fathers of the community. The classes are all on topics relevant for such a period of discernment and formation within the monastery: Cistercian History, Rule of St. Benedict, Biblical Prayer and the Psalms, Church History, Latin, Theology of the Spiritual Life, Theology of Liturgy, Theology of St. Bernard, Gregorian Chant and the Constitutions of the Cistercian Order. The classes are intended to educate the novice about life in the monastery, but they are not designed to simulate the pressures of graduate studies. In fact, efforts are taken to ensure that the novice lives in a relatively free environment that promotes the clarity of mind and availability of heart necessary for such a time of discernment. Br. 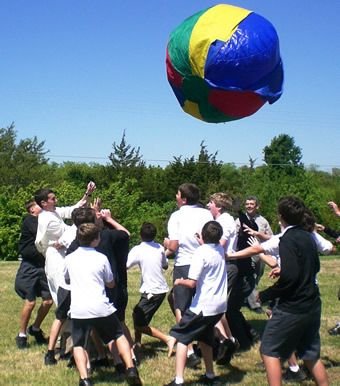 Anthony (left) plays with Form IV Retreatants. Within a framework established by the novice master, novices are given the opportunity to recreate individually, with each other and with other members of the monastery. While silence is observed in the monastery after the nightly rosary and before the end of breakfast, novices are encouraged to speak and to foster supportive relationships within the community. Recreation is essential for a healthy life; novices, therefore, are encouraged to spend certain, specified periods of time in a healthy form of relaxation. They are, furthermore, required to spend appropriate amounts of time exercising and sleeping. Certain forms of recreation, however, such as the internet when used for entertainment or social media, are not permitted. In order to assist the novice in the establishment of a new life, he is allowed only limited contact with his family and friends. Under normal circumstances, one email or phone call every four to six weeks is considered appropriate. All of a novice’s material needs – any toiletries, new clothing, school supplies, and so on – should be sought from the monastery, since he is not permitted to buy or to receive gifts or to possess any money outside the discretion of the novice master. Above all, a novice’s most important task is to listen to the voice of God speaking to him through life in the monastery. Through his participation in the prayer and life of the community, he joins not only his brothers in the monastery, but also the countless other monks who have gone before, in the effort to follow Christ lovingly in the “labor of obedience” (Rule of St. Benedict, Prologue), together offering their bodies and lives as a living sacrifice to our Almighty God and Father (cf. Romans 12:1-2).